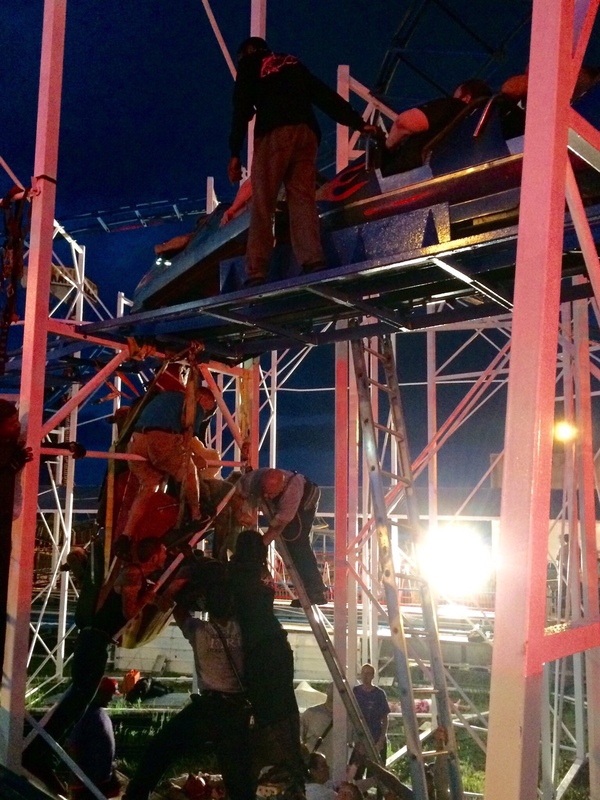 The picture above is from the Daytona Beach Fire Department who is in the process of rescuing people stuck on a roller coaster at the Daytona Beach Boardwalk. The coaster has derailed and two people have fallen about 25 feet. There is no word on their condition, but crews are working to get other riders off the coaster. We dont know much about the coaster, except that it’s on the boardwalk area. The accident occurred around 8:30 pm. This is a developing story, and we’ll have more as it happens. The coaster looks to be Sandblaster at Boardwalk Amusements. Crews are still working and a new picture shows just how bad the situation is as the front coaster train is literally hanging off the rails. There are still riders trapped on the front car. As fire rescue is working furiously. Our hopes and thoughts are with them and we are hoping for the best. There’s still no word on the two thrown from the coaster, but these things are rare and coasters are generally very safe, especially at larger theme parks. Statistically riding a coaster is safer than driving a car, unfortunately accidents do happen. The two riders who were ejected were not seriously injured, and were alert, according to officials. Thank goodness. We’ve seen accidents on coasters go so much worse. Ten people in total were rescued from the coaster. Two fell 34 feet to the ground. Six of the ten were taken to the hospital. No serious or life threatening injuries reported. Previous PostReview: Incredibles 2 is fun, touching and the best Superhero sequel to date Next PostAmerican Horror Story Season 8 Crossover Confirmed!